HomeMarch 2014What does it mean to be “hugged by God”? “Last year I understood in a deep way what it is to be ‘hugged’ by God. I was diagnosed with serious illness. It happened very suddenly and I had no experience to help me cope,” writes Margaret Walsh. Have you heard the phrase “hugged by God”? Jesuit Father Brendan Byrne uses the term in his commentary, A Costly Freedom, on the incident in St Mark’s Gospel (9:33-37) where Jesus embraces a little child in order to teach his disciples a crucial lesson about the nature of God. Byrne writes: “Jesus’ gesture of hugging the child in front of all shows more powerfully than any words could express the preciousness of each and every human life in the sight of God, no matter how small, how insignificant. We are all – in our ‘littleness’ rather than our achievement – hugged by God in this moment”. Last year I understood in a deep way what it is to be ‘hugged’ by God. I was diagnosed with serious illness. It happened very suddenly and I had no experience to help me cope. Over a subsequent period of some months I lived with ‘littleness’, a state of total weakness and dependence, a genuine poverty of spirit. But that same poverty of spirit enabled me to see: to recognise God through the ‘ordinary’, through an astonishing array of basic gestures of day-to-day kindness, love and support. In this context I felt I was embraced by God. I cannot draw attention to all who gave to me but those I don’t mention know who they are and how grateful I am for their love. When one’s energy is seriously depleted, attendance at Mass and the usual rituals of prayer become too difficult. I stopped going to Mass; personal prayer was reduced to the repetition of a simple mantra. But I knew that others were praying for me, sending heartfelt petitions to God on my behalf. My husband brought me communion every day with repeated assurances of prayers from the prayer community of my parish. I knew this was true of them and I came to realise that it was also true of many others, some of whom I had thought to be scarcely more than strangers. One special group of friends shared their love with the locals. Every Thursday, the group of volunteers I had worked with each week preparing a meal for the street people in Kings Cross, held hands around their tables in Cafe 59, the venue for our 10 o’clock coffee break, “to say a prayer for Marg”. One morning, a man, about to enjoy his bacon and eggs, was urged to join in. “But I’m an atheist,” he protested. “It doesn’t matter, you can still hold hands with us and wish for Marg to get better.” This he did though whether he ever returned to Cafe 59 for breakfast, we don’t know! That ordinary statement “you’re in my prayers” became deeply meaningful. My need became embedded in the rich prayer-life of others – men, women and children dear to God – and I was gifted with calmness of mind and a trusting spirit. In combination, the complex medical reality of hospital visits, specialist consultations, major surgery is daunting, even frightening in prospect but the basic qualities of care, respect, humour and kindness were there in every member of the medical team who treated me, and this reinforced my trust. Nowhere was the strength of the ‘ordinary’ more in evidence than in the chemotherapy room. Here, at regular intervals of one, two or three weeks, for varying periods ranging from six months in some, to several years in others, women of all ages and backgrounds are treated together on certain days. As we sat together for several hours, we would talk and the power of the ‘ordinary’ in the women I met and the nurses who looked after us, was profound. The nurses were such an important aspect of this place and its ethos. They knew their job and did it with skill and understanding. They were good fun, always hungry because they had no regular meal breaks, openly relishing the chocolates and cake that patients brought in with them, ruefully admonishing themselves for it. Conversations were realistic but the ordinary was dominant – hope for a return to health, love of family, chagrin and wry humour at the loss of feminine attributes like hair, gratitude for the kindnesses of friends and friends of friends, talk about the children and the grandchildren, work, where to shop for the special needs the illness imposed. I never met anyone who dramatised her situation, succumbed to the ‘flutters’ or even the mildest form of hysterics. The tone was positive, the thrust “let’s get on with this and get back to living our ordinary lives”. Was God present in the laughter as well as the seriousness, the weakness and the strength that characterised that place and those people? I definitely think She was. During this period, I needed flowers and flowers came to me in all their variety and charm. One morning, early on, I felt lost; winter darkness and cold did not help my mood. I sent a text to a wonderful friend I worked with at St Canice’s: “I feel down, John. I need a handsome man to bring me some bright flowers”. I had hardly sent the message when the door bell rang and a beautiful floral array was delivered to me from my beloved Good Sams. John soon followed with his brazenly bright gerberas. Word must have ‘got around’ because, from that day, I was never without flowers. They came in all forms – a beautiful orchid stayed with me all the winter, bright gerberas made up for the sunlessness of my terrace house, bouquets of natives told me that it’s possible to maintain one’s unique God-given form and beauty no matter what nature throws at you and, as spring came, gold daffodils were foil to sweet, fragile little offerings from people’s back yards. Was God in these gifts to me of something as ordinary as flowers? I have no doubt that He was. They, like the prayers, the practical gifts of food, help with the cleaning and the shopping, the cards, the messages of support, made me rich in my poverty, rich in the knowledge that I was loved, rich in the recognition of the unselfconscious goodness of the ordinary person and rich in the understanding of how beautiful a thing it is to receive, to allow yourself to be “hugged by God” through the ordinary goodness and kindness of ordinary people. Margaret Walsh’s working life was spent teaching in State and Catholic schools and, on occasions, in tertiary institutions, overseas and in eastern Australia. 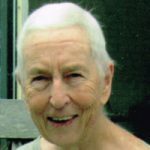 Her contacts with the Good Samaritan Sisters have been life-long and wide-ranging and in 2001, her history of the congregation, "The Good Sams, Sisters of the Good Samaritan 1857-1969", was published.